To get the full back story about this golf lesson, head over to this post that I wrote earlier in 2013. Richard really is one of the best golfers I’ve played with. I should mention that Richard is Clare’s dad – so he’s sorta the father in law. Clare’s mum is always giving me a hard time about not making an honest woman out of her. Clare keeps telling me she doesn’t want to be a golf widow. So it’s all a bit difficult. I’ve started calling Richard “Hollywood”. He doesn’t like that either. 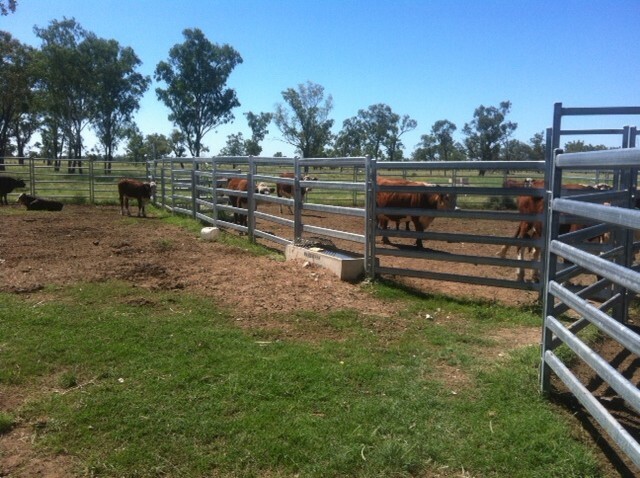 I’m in Goondiwindi this week to get away from the rain. It is driving me nuts and the putting green is unlikely to be finished much before the end of the month. The main fairway is so wet that I bogged the mower Sunday – so instead of hanging around the coast and getting grumpier, decided to head west with the family and get some sun. Today I was out on the farm and got to witness some calf marking (amongst other things). This was a fair eyeopener for a city slicker. 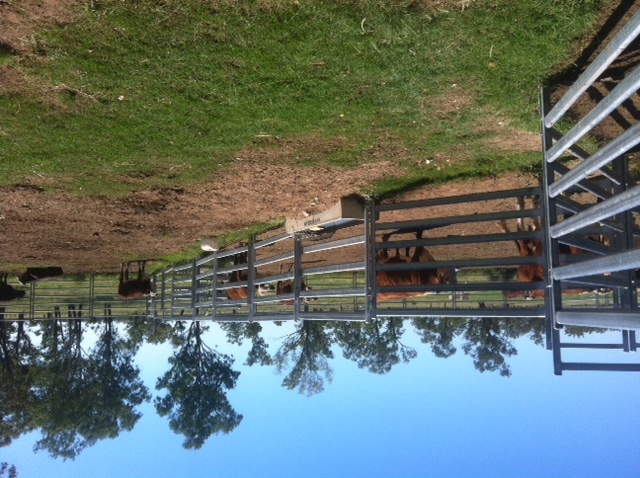 I didn’t know whether to laugh or cry when the baby bulls had some of their equipment removed. I’ll spare you all the details but did take this happy snap. He was telling me the boys liked his blog post. He wasn’t so sure. He said he has been watching the video and doesn’t like what he sees. Says his swing is ugly and unorthodox. This is where the problems have started. Richard has been tinkering with his swing. Trying to make some changes to “fit in” and make his swing look better. But it’s not working – he hasn’t been playing well. Quite awful in fact. I’m probably to blame, because before I made Richard a “celebrity” he had never seen his swing and certainly never gave it much thought. He’d race to the course, get out his cart and go play. He’d be finished the 1st hole before most others had reached the pro-shop. If you’re not on the ball you’d get left behind. And this is his charm. He just looks at the target and pulls the trigger. 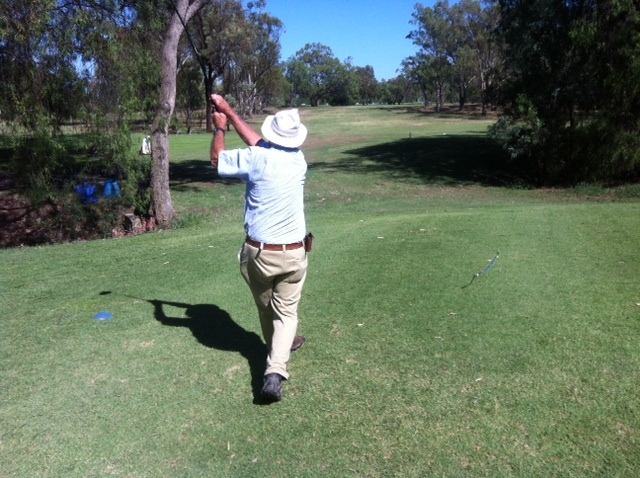 Along the journey, developing a handy game that makes him one of the best senior golfers at his club. But this tinkering has changed him. He’s trying to swing properly and nice and it’s not doing him any favours. He’s miss hitting more than usual and he’s definitely lost a little of the spark. And this is the problem with trying to fix your swing. Or put another way, trying to swing in a way that satisfies the status quo. Richard’s quirky style found him. By playing objectively his learning system worked out all the minor details (like how to hit the ball) while Richard is free to hoon around the course and have the time of his life. Once Richard (or anyone) disrupts this natural process the rot can set in. So you’ve gotta be careful as years can pass you by before you realise you’ve destroyed your swing and lost some of your best golfing years. The tough part of automatic learning is having the guts to trust in your learning system and have the belief that your way is better than trying to fit into some perceived “right” method. You almost need a carefree spirit to not care about how you look, but only be concerned with how you play. I’ve given him a pep talk and hopefully he’ll be back to his old (and brilliant) way soon. Basically he switched from automatic to manual. My Dad did a similar thing. Able to show him that seniors finish was really similar to dads. He just swings now and still has the best short game in the club. Cool. I like it when we realise “our” way is better than all others. Keep an eye out for dad, he laps the course quite a bit as well! Only played 10 holes – the mozzies were so bad they nearly ate me alive. I’m still a city slicker at heart and couldn’t stand them. They drove me crazy.